Many people turn to drugs or alcohol to relieve stress, depression, or anxiety. Some also turn to food for comfort. Food can become a problem for many people who experienced past trauma. Eating disorders come in many forms such as anorexia, bulimia, and binge eating. In any form, an eating disorder can cause physical disfiguration, impairment, obesity, heart failure and death. When a person has an eating disorder, he or she develops an addictive relationship with self-destructive eating patterns. An individual with anorexia will starve his or herself because of their distorted perception of how they look. A person with anorexia literally starves to death. The lack of food causes extreme weight loss, hair loss, and impairs the body’s organs. An individual with bulimia eats normally or binge-eats, then immediately and intentionally vomits the food. He or she might like the taste of the food but throws up to avoid gaining weight. Bulimia can cause tooth decay from the stomach’s acid that comes up with the food. A person who has bulimia is at risk of developing severe physical impairments and death. An individual who has an eating disorder shows similar characteristics of a person who is addicted to drugs or alcohol. These addictive behaviors are self-destructive, harmful, and deadly. When a person has an eating disorder, he or she loses control and the ability to stop. Eating disorders are related to some of the psychological effects of starvation, which appear to be similar to symptoms of addiction. 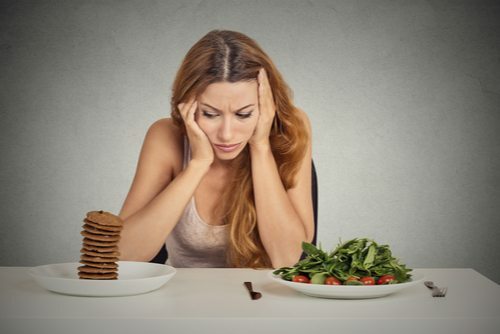 A person with an eating disorder is preoccupied with food and experiences the urge to binge, is irritable, depressed, and overeats as a response to stress. Starvation can make a person feel they are addicted to food. This can cause the person to avoid food and reinforces the person to feel addicted. The causes for developing an eating disorder or drug addiction are very similar. Social pressure, impulsivity, stress, and emotional trauma are reasons a person turns to addictive behavior. Eating disorders and substance addiction develop from stressful situations as a way to cope due to emotional distress. Eating disorders and drug or alcohol addiction are chronic diseases with high relapse rates. All require treatment for recovery. Cypress Lakes Lodge specializes in treatment for addictive behaviors, which helps develop healthy, sober, and sustainable relationships. Cypress Lakes Lodge is committed to the overall health and successful recovery of every client. Get help today for a rejuvenated, confident, and healthy you.